Many of us never have to attend a hearing or trial in a courtroom until we’re going through a divorce. 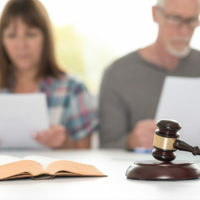 Going to court for a matter related to your divorce can be stressful and intimidating, both due to the high tension and emotions involved in the divorce itself, and due to wondering whether you’ll know and adhere to the rules of being in court. While it is important to behave respectfully and appropriately in a Texas courtroom, it isn’t hard to understand how to behave appropriately before a judge. Below, learn four of the most important rules to follow when in court on a divorce proceeding, and contact a knowledgeable Houston divorce lawyer for more information. Nothing will diminish your reputation with the judge faster than showing up late for your court hearing. Be sure to leave yourself plenty of time to get into the courtroom, keeping in mind what parking near the courtroom may be like and potential lines at the security checkpoint at the courthouse entrance. These steps often take much longer than you anticipate, and you’ll want at least ten or fifteen minutes to discuss with your attorney what you should expect at the hearing. Also be sure to check what the court’s rules are on bringing electronics into the courtroom. Some courts will require you to return your laptop or cell phone to your car if you’re carrying them when you arrive at court. The judge deserves your respect and deference—especially when you consider how much power they hold over your case. While you don’t need to wear a three-piece suit, you should wear something professional and tidy, such as you might wear to a job interview. If the judge asks you a direct question, you should always refer to him or her as “your honor” when you respond. It is also customary to stand when speaking to the judge. One great reason to hire an attorney to represent you in a divorce is so that you don’t have the opportunity to say something regrettable in open court. Parties to a case who are represented by a lawyer should not speak in court unless they’re on the witness stand or have been addressed by the judge. If your spouse’s attorney or a witness says something outrageous, let your attorney address it, and keep your thoughts to yourself. No matter how offensive, untrue, or unkind a statement may be, loud outbursts in reply are never appropriate. Looking bored or uninterested in the proceedings when you’re in court on a matter that should hold a great deal of importance to you will not endear you to the judge. Nor will becoming hysterical, aggressive, or otherwise emotionally volatile. If you have thoughts that you simply must express, do so in writing to your attorney, while remaining outwardly calm. For compassionate, effective, and professional legal help with your Texas divorce, contact the Houston Law Offices of Maria S. Lowry at 713-850-8859.